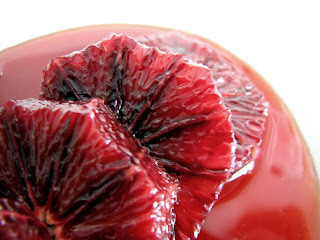 Blood oranges possess a rare beauty that almost defies our senses. 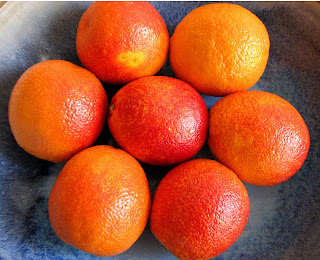 Ranging in color from vermilion to scarlet to deep crimson and more unusual in flavor than other citrus, blood oranges are among the best of the current crop of fresh fruit. Blood oranges likely originated in the 19th century in Sicily and found their way to America sometime in the 1930's via the travels of immigrants from Italy and Spain. There are about three varieties but the Moro is the most commonly found in our regions. The exterior skin is often tinged with a dark red blush and the interior can sometimes be variegated. They are just stunning to slice into and the juice is deliciously bright. 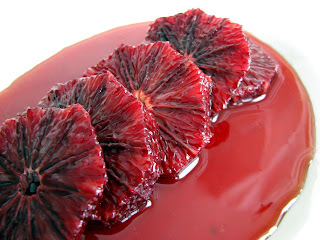 Having a blood orange will quench your every thirst. 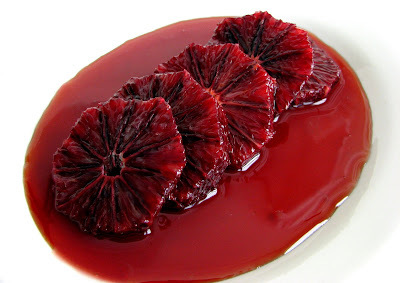 Best enjoyed in their freshest simplicity, I decided to recline them in a bit of Blood Orange Caramel to echo another layer of relentless color that is riveting in its intensity and beauty. These jewels are definitely a supreme wonder of nature. - As with any citrus fruit, select the ones that are heavy and thin skinned. They will be the juiciest. - As the sugar for the caramel begins to darken, gently swirl the pan if it starts to color in just a few spots. This will help to evenly distribute the darker sugar so it cooks uniformly. - Always use caution when making caramel. Hold the pan away when adding the liquid to avoid any splatters from hitting your skin. Caramel burns really hurt! - You can add a drop of good balsamic vinegar to the caramel for more complexity. Start with just a tiny bit and keep tasting until you have the right balance of tart and sweet, avoiding what I call “throat burn” that will linger if you add too much acidity. Juice the oranges until you have 1/2 C juice. Peel the remaining oranges with a sharp knife, making sure to cut away the pith, and slice. Combine sugar and water in heavy small saucepan over medium heat. Boil without stirring until it reaches a medium-dark amber color, occasionally brushing down the sides of the pan with a wet pastry brush to prevent crystallization. Take off the heat just as it’s reaching the right color and carefully add the orange juice. The mixture will bubble vigorously. Stir over low heat until smooth. Cool completely. Divide the orange slices among four plates and spoon the caramel over each. I once worked on a food series for public television, which was an incredibly amazing and exciting opportunity. I learned so much about what happens behind the scenes and how much work actually goes into producing a food show. We shot 26 half-hour episodes in less than 3 weeks and it was really pretty crazy and stressful but also a ton of fun. I could write a book about all that happened. My job as a culinary production assistant was to do a final plating of all the ingredients for the set. The food stylists would style the final shot of each finished dish. You can’t imagine how many people are involved in this kind of production. It is a very intensive team effort. Because filming and studio rental are so expensive, time is always of the essence. Behind the scenes we had to be sure to have three back-ups of all the ingredients for each course in case something went wrong. Each show had at least 3 courses, each with many ingredients, so I'm sure you can imagine just how very complex this could get. Everything had to be staged just so in a particular sequence, which sometimes changed from the script of the night before. When the producer called for an item, it had to be perfectly ready for the cameras in all the various stages of the preparation process. Which brings me to soufflés. 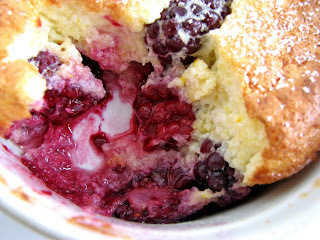 This recipe for Cornmeal Berry Soufflé is simple and delicious. But trying to photograph and capture its lovely soufflé light-as-air volume was certainly impossible. To begin, I had all the ingredients prepped but the sun kept disappearing. And since I shoot in natural light, I had to be sure the sun would cooperate at just the precise moment that the soufflés came out of the oven. That in itself was pretty hilarious. And unlike a television studio, I didn’t have a coterie of assistants and several back-up preparations to get me through the shoot. Then there was the steam emanating from the soufflés. I'd really love to see how this is done by editorial stylists. I surely missed the best shot, so forgive my compromised photos of this delightful dessert. The base for this dessert is an orange infused cornmeal mixture. The small amount of cornmeal lends a little bit of texture to the creamy soufflé. 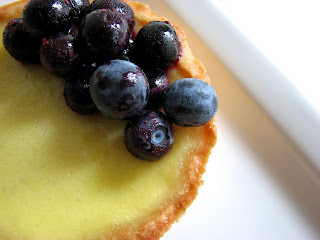 The orange is a nice accent for both the cornmeal and the berries. 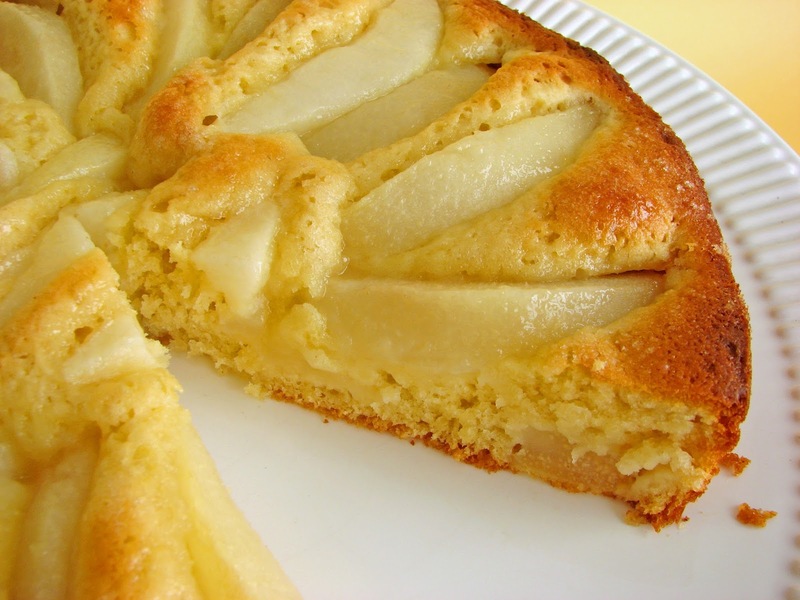 The texture is soft, the flavors subtle and really delicious. It makes for a light and luscious dessert. But make sure you eat them straight out of the oven. Their deliciousness depends on them being warm and airy. No time for second takes! - I added a few things to the recipe to brighten the flavor: a pinch of salt, a couple drops of vanilla extract and a splash of Grand Marnier. The recipe also called for them to be baked in a bain marie, but I don’t find that necessary. 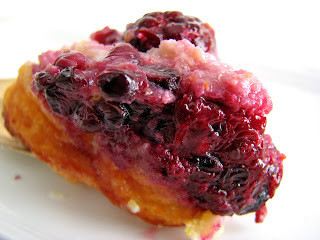 - The recipe called for raspberries, but I had fresh blackberries so I went with them instead. I think this dish would also be fierce with honeyed fresh figs, juicy fresh cherries, peaches, apricots, even spiced dates. 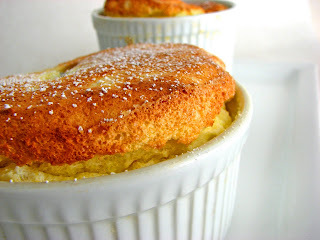 - Soufflés are a good way use up egg whites. Each egg white weighs an ounce, so it’s easy to measure out if you have a scale. Combine the milk and orange zest and bring to a simmer. Remove from heat, cover and let steep for about 30 minutes. Slather four 1-cup ramekins with butter and dust them lightly with sugar. Return the milk to a simmer with the 2 tablespoons of sugar and a pinch of salt. Slowly drizzle in the cornmeal in a thin stream to avoid clumping. Add the orange juice, vanilla and Grand Marnier and simmer over low heat, whisking constantly, until the mixture is soft and creamy, about 4 or 5 minutes. Transfer the cornmeal mixture to a bowl and cool slightly. Beat the egg whites until foamy and opaque. 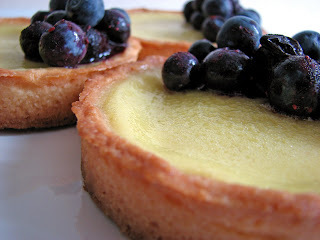 Slowly add the 2 tablespoons of sugar and keep beating until soft peaks form. Fold about a third of the beaten whites into the cornmeal mixture. Gently fold in the remaining egg whites. 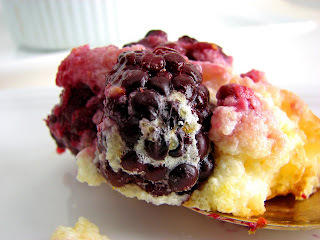 Fold in the berries just before the mixture is thoroughly combined. Gently spoon the mixture into the four prepared ramekins. Bake for about 24 minutes or until the soufflés have risen and are golden but still soft in the center. Dust with powdered sugar and serve immediately. Professional pastry kitchens are always imprinted in every way with the unique perspective of the Pastry Chef. I’ve been very fortunate to work with many wonderful pastry chefs, each with their own distinct style and attitude. Sometimes it’s a resolute commitment to the highest quality fresh ingredients grown locally in adherence to the practices of sustainable agriculture. Sometimes it’s an insatiable curiosity about the newest methods and ingredients and always pushing the envelope to fashion new flavor sensations. Or maybe it’s all about executing a classical technique and repertoire. I’ve seen some of the most amazing organic fruit imaginable, learned about the transformational power of the tiniest drop of culinary essential oils, worked with the world’s best chocolate, deconstructed this and that and reformulated and dressed up the ordinary. Chefs can be masters of the pure and simple or obsessed with powders and foam, but they are always insistent on absolute perfection in texture and taste, wizards of the crumb and the miniature morsel. Whatever their approach, the range of curiosities and renderings of your Pastry Chef stay with you forever. One such chef was a fiend about tea, among many, many other things. He produced some amazing desserts where good quality tea could shine. 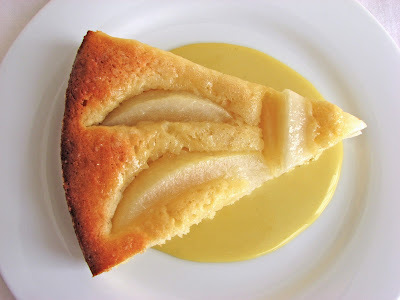 And just as I was making this Yeasted Pear Tart I had a sudden memory of a delicious Chamomile Anglaise and thought its subtle flavor would go well with the subtlety of pears. Little did I know just how well chamomile actually pairs with the essence of yeast. It’s so incredible that I wonder why I’d never tried it before. Something about that wild yeasty aroma and flavor combined with the simple fresh garden richness of chamomile just seem so perfect together. Both of these elements are quite simple to prepare. The tart dough takes about 5 minutes and then you let it go through its lovely and mysterious rising process. The sauce can be made in 5 minutes once it’s had a good steeping period. I hope you’ll have a chance to try this sometime. 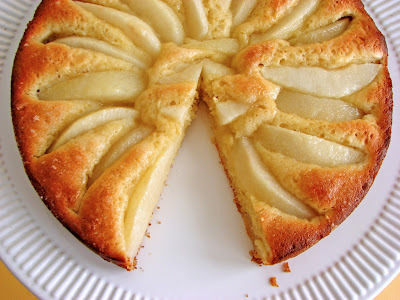 It would be perfect for a Sunday brunch or a special teatime. Or really just any time at all. - This anglaise is not particularly heavy because I wanted the freshness of the pears to shine through. I use half and half and just enough eggs to hold it together. - Be sure to use pears that are ripe and very juicy. I think Bartletts work well here. To make the anglaise, bring the half and half to a simmer and add the chamomile tea. Remove from heat and let it steep for at least an hour or until the flavor is strong enough. Put through a fine mesh strainer and return the milk to a simmer. Whisk yolks and sugar until light. Add a small bit of warm milk to temper the yolks, whisking constantly. Add the remaining milk and whisk thoroughly. Return to low heat, stirring constantly with a wooden spoon until mixture thickens and coats the back of the spoon. Remove immediately and pour off into a clean bowl to cool, stirring occasionally. Peel, core and cut the pears into 1/2” slices. Sprinkle with lemon juice to prevent browning. When the dough is ready, dampen your hands a bit and gently press down on the dough, spreading to cover the bottom of the pan evenly. 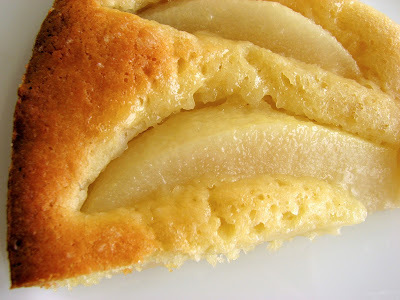 Arrange the pear slices in a decorative way over the dough, leaving a 1/2” border all around the edges. Press the pears down firmly into the dough. 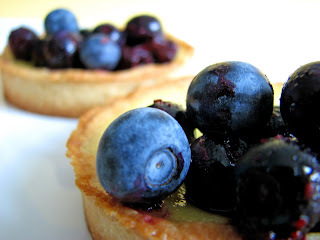 Sprinkle 3 tablespoons of sugar over the entire surface and let the tart stand for 30 minutes. Preheat your oven to 350 degrees. 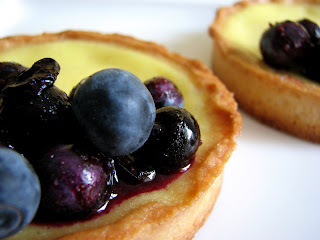 Bake for 40 minutes or until the tart is lightly browned and the center feels slightly firm to the touch. Cool slightly and serve with Chamomile Anglaise.